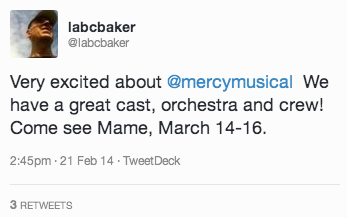 I was quite flattered when two cast members of Mame, Mercy's upcoming school musical, told me that they had created a Twiiter account to promote their show. They hope that I would tweet about it. They said that their music teacher, Mrs. Ferguson had identified me as an avid tweeter. She was right -- Last week I published my 3,000th tweet! I regularly encounter colleagues who do not "get" Twitter at all. They are very surprised to find that I claim it to be my best source of professional development. I have cultivated a wonderful network of tweeters interested in educational technology. In 140 characters or less they point me to an incredibly rich variety of resources and opinions. I take some of the most interesting links and put them in my blog. One of the best features of Twitter is the hashtag. By creating a code following a pound sign (#), tweeters can track a topic or conversation. I have done this for our upcoming Tech Talk conference (#mhtalk). I am hoping that attendees like Karen Bosch (below) will discuss the conference on Twitter using the hashtag. As an avid sports fan, I also enjoy Twitter. Again, by following a selected group of sports tweeters, I can enjoy a high level of chat during a televised game. Or I can actually interact with reporters and bloggers who are at a live event. For example I have tweeted back and forth with beat reporters who are in Lakeland, Florida covering the Tigers' spring training. In sum, I have found Twitter to be interesting and helpful. I use it daily to promote my school and my public activities. It is the most important source of my professional enrichment. But is also pretty much insures that I never have to watch a game alone. I'm looking forward to the next three thousand tweets.